and Hey Duggee is one of our favourites. Isn’t the theme tune just so catchy don’t you think?!. So when we were asked to review ‘The Best Scarecrow Ever’, we jumped at the chance. Hey Duggee was created by Studio AKA and aired on CBeebies the start of this year and became an increasingly popular animated series. It has now become available as a story book for kids to enjoy, published by Ladybird books, part of the Penguin random house group. First a little about the characters in the book. 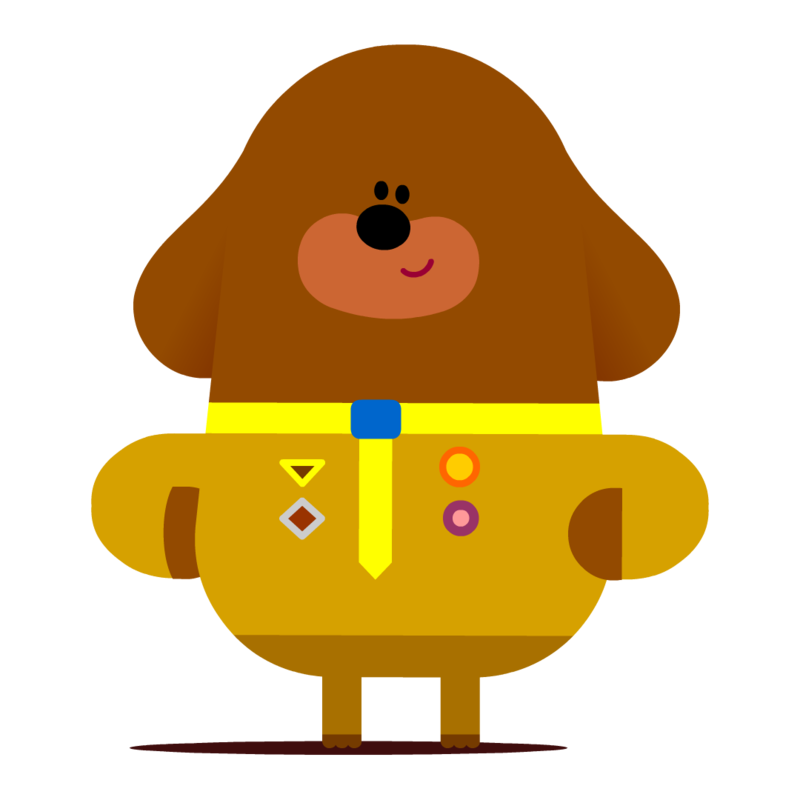 Duggee is a loveable big Dog who runs the squirrel club. Roly is a Hippo and the loud and enthusiastic one of the group. Happy is a small happy Crocodile who loves splashing in water. Norrie is a chatty, giggly and super fast Mouse. Tag is a sweet natured Rhino. He is quite clumsy and often bumps into things. Betty is an intelligent and imaginative Octopus. They all turn up to club to take part in all kinds of activities, have adventures and earn badges along the way. The story is about how Duggee and his little animal group want to grow some corn, but the sneaky birds keep stealing all the seeds. So the team create “The Best Scarecrow Ever”. It is beautifully illustrated and nice and colourful. 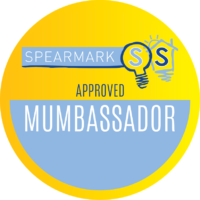 It has an activity section to the back where your little one can interact and take part in small challenges. There is also a cool novelty Scarecrow badge certificate to hang on the wall once the challenges are completed. It is a lovely book with a great easy to follow story line, keeping the reader involved and interested. It is recommended for 3years +, at a very reasonable price of £6.99. 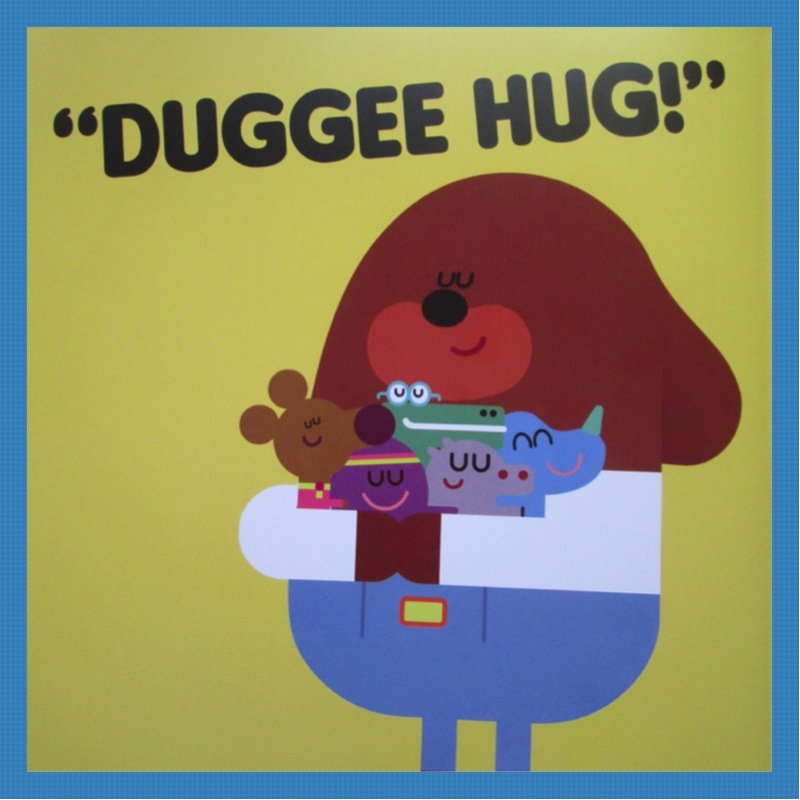 and you even get a DUGGEE HUG thrown in for free!. 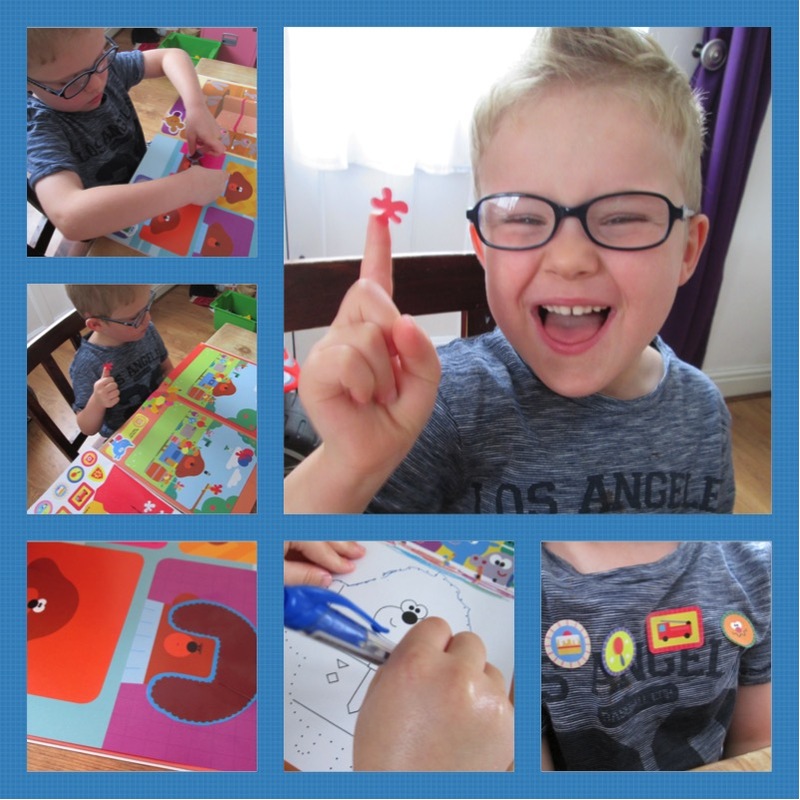 which is full of puzzles and activities, and a pull out double page full of stickers and squirrel badges that you stick in the book, but Monkey preferred to show his badges off on his top. A great pass time with plenty to do. You can get a copy of this for £3.99. 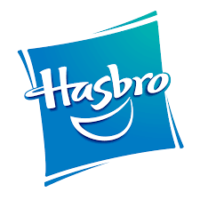 More information can be found over at Penguin books website. 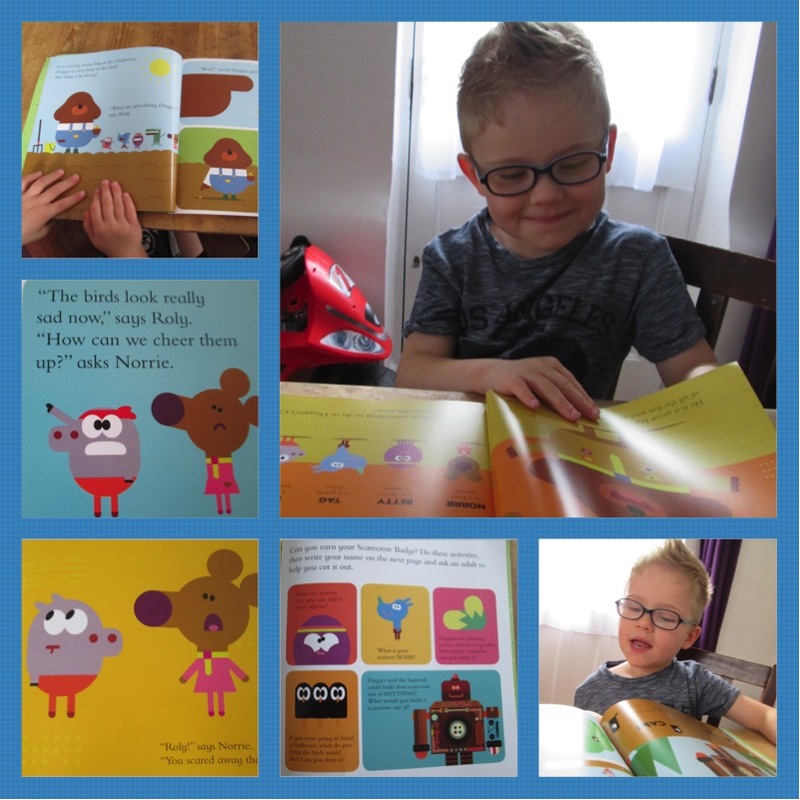 Duggee can also be found on Twitter – @HEYDUGGEE @ladybirdbooks and @CBeebiesfun. *I was sent these books free of charge for the purpose of this review, all thoughts and opinions are my own*. Hehe, we know most of the theme tunes. Yes my 9 month old loves him too. Sounds like this is perfect for your little ones then :).